Hailing from Southern California, Lithium Cycles created the SUPER73 electric motorbike in 2016 after an exceptionally successful Kickstarter campaign. Since then, they've become the most popular electric bike on the internet, striking a chord with many. 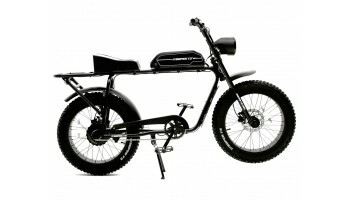 The vintage motorcycle designs of inspired design is a distinctive blend of urban cruiser and off-road scrambler. 4" wide tyres means you can ride anywhere, be it sand, snow, mud or the city streets. We are sorry, but we cannot ship to; Austria, Denmark, Finland, France, Germany, Norway, The Netherlands, Sweden and Switzerland. Customers in these territories, please visit Lithium Cycles to find your local dealer.